Preface by Margaret Thaler Singer, Ph.D.
Introduction by Michael D. Langone, Ph.D.
1. 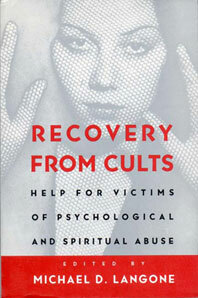 Helping Cult Victims: Historical Background by Michael D. Langone, Ph.D.
3. Reflections on "Brainwashing" by Geri-Ann Galanti, Ph.D.
4. Understanding Mind Control: Exotic and Mundane Mental Manipulations by Philip Zimbardo, Ph.D. and Susan Andersen, Ph.D.
8. Exit Counseling: A Practical Overview by David Clark, Carol Giambalvo, Noel Giambalvo, M.S. Kevin Garvey, and Michael D. Langone, Ph.D.
10. Post-cult Recovery: Assessment and Rehabilitation by Paul R. Martin, Ph.D.
11. Guidelines for Therapists by Lorna Goldberg, M.S.W., A.C.S.W. 12. Guidelines for Clergy by Richard L. Dowhower, D.D. 13. Guidelines for Psychiatric Hospitalization of Ex-cultists by David Halperin, M.D. 14. Guidelines for Support Groups by William Goldberg, M.S.W., A.C.S.W. 15. Guidelines for Families by Arnold Markowitz, M.S.W., C.S.W. 16. Guidelines for Ex-members by Madeleine Landau Tobias, M.S., R.N., C.S. 17. Children and Cults by Michael D. Langone, Ph.D., and Gary Eisenberg, M.A. 18. Ritualistic Abuse of Children in Day-Care Centers by Susan J. Kelley, Ph.D., R.N. 19. Teen Satanism by Rob Tucker, M.Ed. 20. Legal Considerations: Regaining Independence and Initiative by Herbert L. Rosedale, Esq.